An extremely happy Blue year for us.. On Monday night the 30th Dec Tui produced this beautiful stunning bunch of pups.. Blues, blue tris & a black boy to boot. Its still pretty much a wow for us… Pups will be sold on restricted register ( which means can’t be bred from) but will be fabulous pets… Tui is such a relaxed dude.. had a great birth & is a very realaxed Mum. 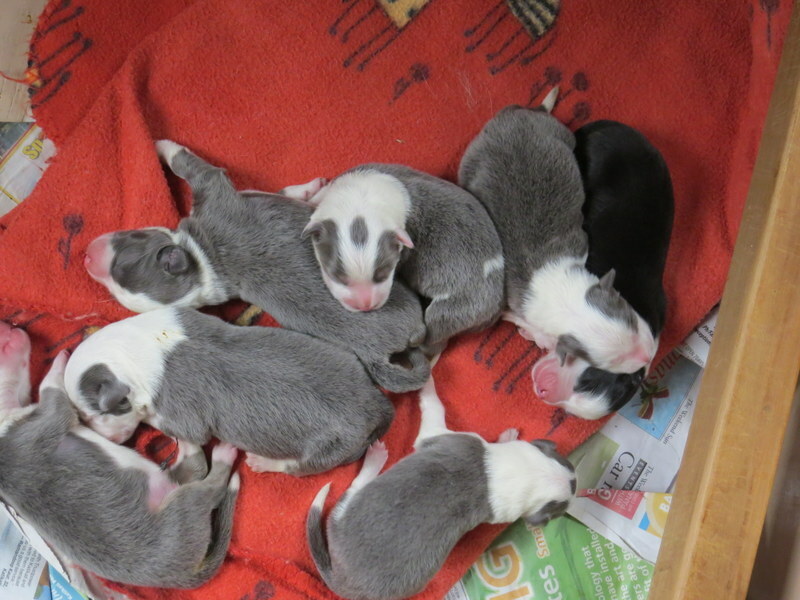 We lost one very small black tri girl which was sad..
And on Xmas eve Riley became a Dad again & this time to Aneedas choc tri Meg & what a rainbow of colours, lilac WOW, blue, chocolate, tri & black. Well done Meg…. So a great start to our year..